I first tried okonomiyaki at Café An An in Portslade, when they had a special day cooking this Japanese pancake/ omelette. It is full of classic Japanese flavours and ingredients, with dashi, spring onion and topped with bonito flakes and seaweed. I got all the ingredients in Japan Centre in London (see below the recipe for more information) and I highly recommend using these as your toppings, because they really make this dish. My recipe uses Chinese leaf as it absorbs flavour really well, but you could use a pointed or green cabbage instead. This recipe makes one okonomiyaki and these are perfect as a quick lunch, or could be served with sushi or takoyaki for a main meal. You must use a non-stick frying pan or wok with a lid (or make a lid with strong foil) as this helps the okonomiyaki become fluffy. Mix the flour and dashi powder in a bowl and add the water. Combine using a fork or whisk. Add the eggs, mix and then add the spring onion and Chinese leaf. Heat the oil in a non-stick frying pan on a medium heat. Using a large spoon to add the okonomiyaki mixture to the middle of the pan, roughly circular, about 1.5 cm in thickness. Sprinkle the crabstick slices (or whatever topping you are using) over the mixture. Cook for two minutes, then once the bottom has started to colour, use a spatula to flip the okonomiyaki. Cover with a lid and cook for a further 3 minutes. Remove the lid and flip the okonomiyaki over again. Cook without the lid on for a final two minutes and then transfer to a plate. 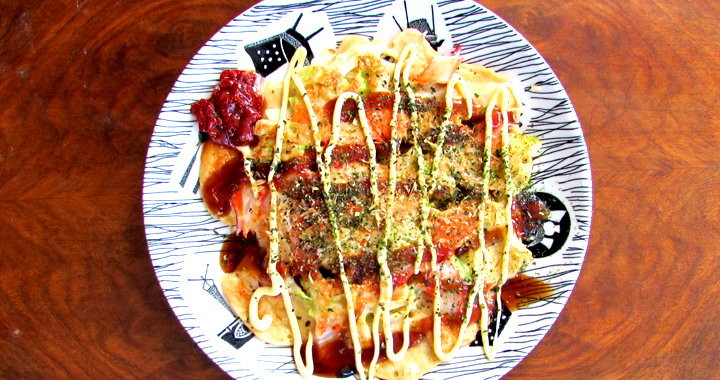 Squeeze the okonomi sauce in a zigzag pattern over the okonomiyaki, then turn the plate ninety degrees and do the same with the mayonnaise. Sprinkle with aonori powder and bonito flakes and spoon a little toban jian on the side to dip. You can find some of the more obscure ingredients on the Japan Centre website. I’ve included links so you can see what they look like, but I’ve found the ingredients in quite a few Chinese supermarkets on my travels (Fortune supermarket in Brighton, for example, has most of these ingredients in its Japanese section). I’ve also included substitutes, where possible. Posted in Main Dishes, Recipes and tagged bonito flakes, Egg, okonomiyaki, Recipe.